While stocks continue to surge on the back of the daily "China trade talk optimism on again/off again" narrative, it is worth remembering that as recently as December, the market was driven by something far more tangible - the ongoing shrinkage of the Fed's balance sheet. 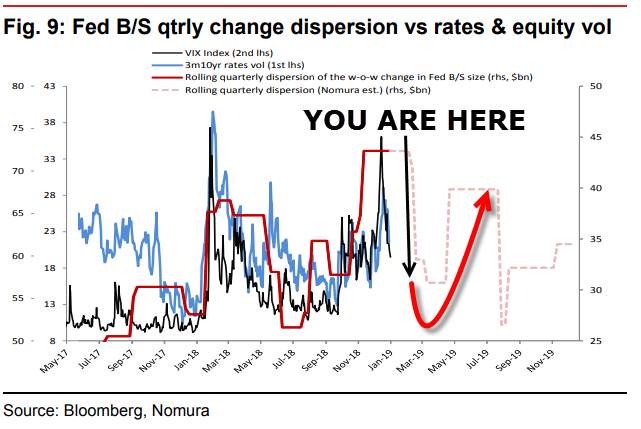 As we wrote on Wednesday, despite the Fed's verbal assurances that its balance sheet is no longer on autopilot, QT continues unabated for now, and most importantly, and as per the Nomura (settlement) schedule below more imminent unwind events are expected, with a major one as soon as today. All this is relevant because while stocks today are soaring higher on deteriorating economic data and "trade talk" optimism, keep a close eye on market action in the last two hours of trading when today's liquidity event is set to come to a head. Indeed, as the Fed reminds us, today's "reverse POMO" is a whopper, with some $43.5BN in US Treasurys on the Fed's balance sheet set to mature, which means the Fed will allow $23.3BN of excess liquidity to shrink. Previewing today's major balance sheet runoff, Nordea writes that "whether we have looked at it daily or weekly, it looks as if SOMA days can be good news for the USD," adding that "the bigger the shrink, the larger the negative effect on equities and the greater positive effect on the USD." 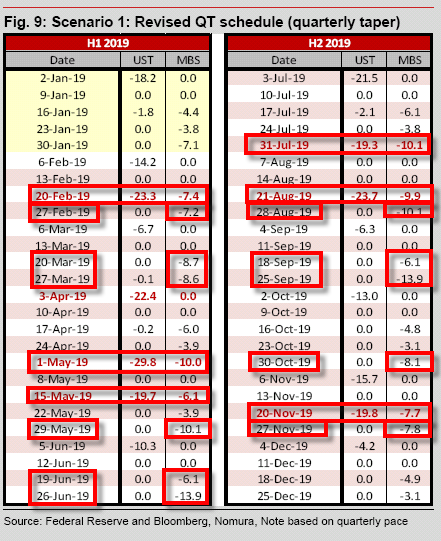 Furthermore, the bank points out that "of the seven weeks when the balance sheet has shrunk by more than 20BN, the dollar has weakened twice – but then by less than 0.1% on the week (Wednesday to Wednesday)," adding that "the weekly QT patterns thus suggest a move higher in the USD between Wednesday, February 13 and Wednesday, February 20, given the hefty SOMA day on February 15."